Hey Folks, we have exciting news for all those contenders who are looking for the latest government job in Chaudhary Charan Singh Haryana Agriculture University Hisar. In this article, we mentioned all the relevant details related to the CCS HAU Group C Vacancy 2018 in the below description of the article. Candidates who want to do a job in Chaudhary Charan Singh Haryana Agriculture University Hisar they may have glance on this article and then you may fill the application form of CCS HAU Clerk Recruitment 2018 from the official portal of the Chaudhary Charan Singh Haryana Agriculture University Hisar i.e. www.hau.ac.in. For latest updates, you can visit our careerjobs360 web page regularly and stay connected with us. The Chaudhary Charan Singh Haryana Agriculture University Hisar has released the employment notification for CCS HAU Group C Vacancy 2018 for fill up 333 Clerk, Steno (Typist) and various other Posts in the department. The department is looking for the well-qualified contenders for the various vacant posts in the department. 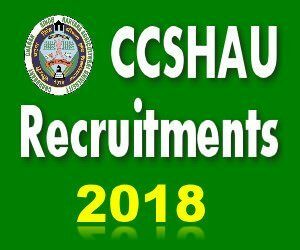 Interested and Eligible Youngster may apply online for this CCS HAU Recruitment 2018 from the official website of the department which is mentioned at the end of this article. You may fill the application form and submit it on or before the closing date that is 04th October 2018. The department has released the deadline date of application form. All the other information related to the CCS HAU Steno (Typist) Notification 2018 such as Required qualification, age limit, application charges, selection process, important dates, how to apply is as given below in the post. All the aspirants can see all the details attentively from here. Educational Qualification: Candidates who want to apply for the CCS HAU Jobs 2018 they must have done 10th, 12th, ITI, Diploma or Bachelor Degree from a recognized university or institutions. Age Limitation: Minimum age limit is 18 years and Maximum age limit is 42 years. Age Relaxation: The relaxation in age will be given only to the reserved category according to the rules and regulations of the government. SC/ BCA/ BCB Female Aspirants of Haryana: Rs. 75/-. First of all, candidates need to go to the official website of the Chaudhary Charan Singh Haryana Agriculture University Hisar at hau.ac.in. Then go to the recruitment section on the homepage and search for the authorized notification for the CCS HAU Group C Recruitment 2018. Download the official notification and read all the instructions mentioned in it carefully before submitting the online application form. Now, click on the appropriate link for the application form and open it. Then, Fill all the essential information in the application form very carefully. Then, the candidates have to upload passport size photograph and signature and attach the required documents in the application form. At last, verify all the details in the application form and then click on the submit button.